This is an amazing and limited time offer to get One on One time with Diana Dentinger. 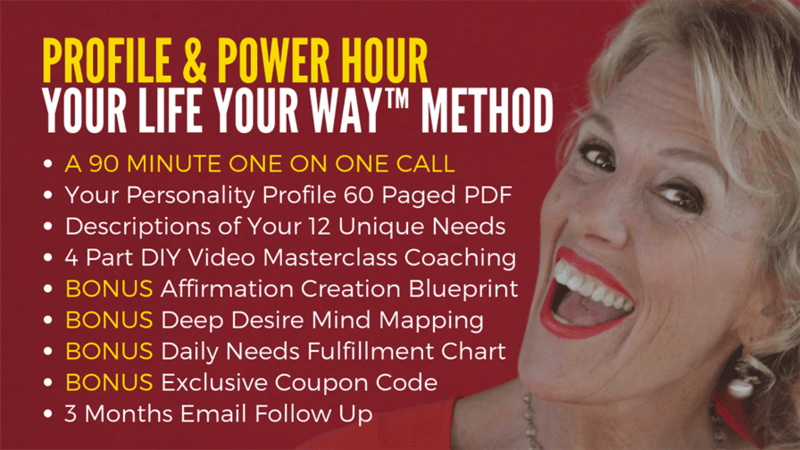 Along with your 90 minute Power Hour Coaching Session, you get your Complete Personality Profile with the descriptions of your innate Needs in the 12 facets of Complete Personality. You get your unique 60 page Your Life Your Way Playbook in pdf format, a 4 part Masterclass Video Coaching Series and Blueprint Bonuses about creating Affirmations, Connecting to Desires and Time Management. You can do it all in a Saturday morning and already see immediate shifts in your energy and confidence. On your call with Diana you connect deeper to “what it’s like to be you” for real down to earth clarity to be everything you are meant to be. Length of Program- Yours forever! 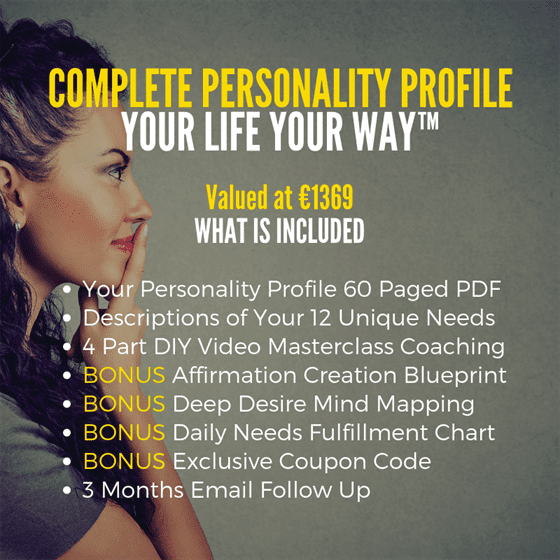 This is your own Personalized 60 paged PDF readout “Your Life Your Way Playbook” that includes the descriptions of your specific Needs in the 12 facets of your Personality. It is delivered to your inbox within 48 hours of you filling out the open ended Personality Questionnaire. Your Playbook serves as a Workbook that walks you through the precise neurological process of knowing and living your innate Needs. 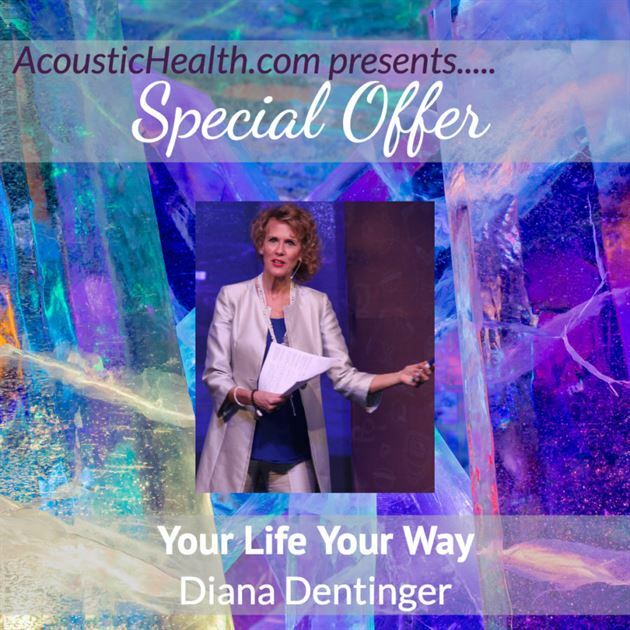 You get real answers as together in a One on One call with Diana Dentinger you dive deep into your issues and desires for heightened perception and practical changes in your life. Book soon as Diana works on a first come first served basis. Diana Dentinger guides you step by step through your Profile in these thought provoking, practical and spiritual Masterclass Video Training Series. It is a fantastic support and offers you important insight into real and long lasting personal and professional growth. Generic Affirmations get you nowhere and are a waste of time. Instead Affirmations based on “Who You Really Are” from your Personality Profile increase your energy because they speak to every cell in your body and amplify your innate talents. It’s time to throw out the bucket list and create instead a Mind Map that helps you better see the flow of your core desires to then get your plan on when and how to fulfill them. You will see how life enriching this process is. Throw away the “To Do” lists. Things get done when they are on your calendar. Once you reconnect to “Who You Really Are”, you are so excited to put yourself back in your life every single day doing what you are meant to do here on earth! Because Personal, Professional and Spiritual Growth require time to feel, see and live the “Real You”, this email support keeps you inspired and motivated to stay on track integrating your learnings and remembering your greatness. Take this Journey of Self Discovery to drop who you aren’t and step fully into “Who You Are” in a more empowering way. You will leave behind the old you and become the real you to live your Life Purpose and contribute to the greater good. Stop searching for answers, get them! Your Complete “Your Life Your Way” Personality Profile includes descriptions of your innate Needs in the 12 facets of Personality. This is more than just information, it is an emotional awakening to remember who you really are in a tangible, practical and spiritual way. You can go through Your Profile, the Masterclass Videos and Bonuses in a Saturday morning and become a new person! “I learned more about myself in 2 days of Coaching with Diana than in attending 8 UPW’s over 4 years. I finally have real answers for how to create relationships and reach success my way. Before I struggled wanting to be understood by other people, my wife at home and my brother in business. In a very few months after going through Your Life Your Way, I made major changes, connected more to my innate intuition and it all feels so great.